Members of the Thin Blue Line Law Enforcement Motorcycle Club presented William Skeen of the 100 Club with $8,800.00. The money was raised April 14, 2018 at the annual Back the Badge Ride & Rally. The Back the Badge event started in 2007 and is presented by the Thin Blue Line LEMC and sponsored by Houston attorney Jim Walker (www.WalkerTexasLawyer.com). 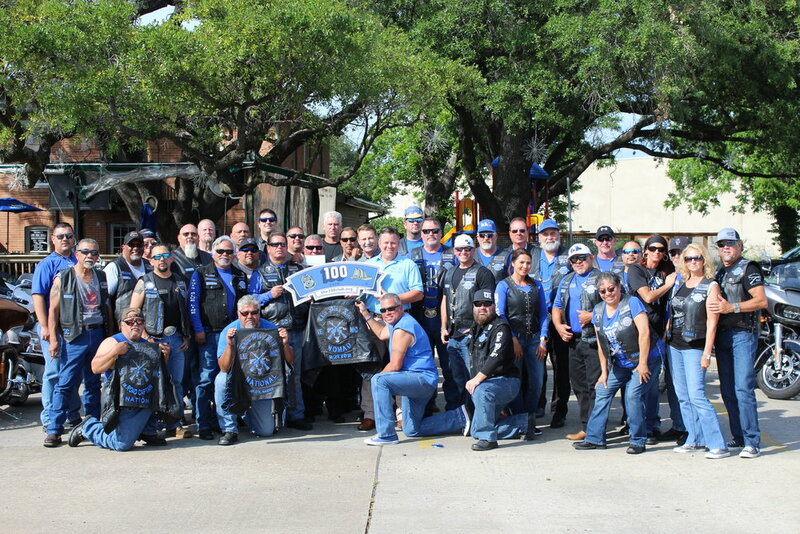 Seen in the photo are William Skeen (Director of the 100 Club), Jim Walker (signature sponsor), Rico Garcia (TBL LEMC National President), Ed "Bullet" Lascano (TBL LEMC Lone Star Chapter President and ride director), Bryan "Promo" Miller (founder of Back the Badge/TBL LEMC member), and members of the TBL LEMC Nation.